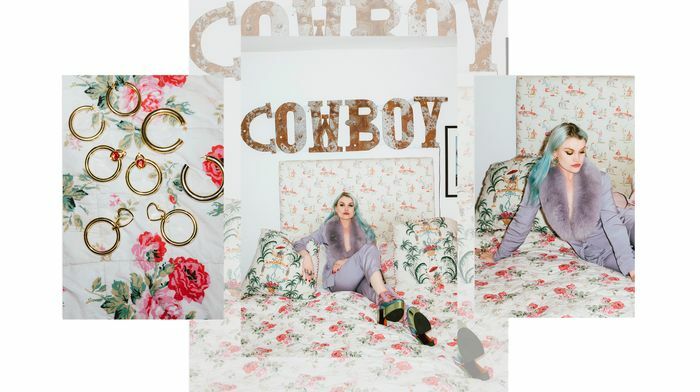 This month we went to east London to dive into a treasure trove of the home that belongs to fashion designer, Coco Fennell. Her vintage-style brand is just a hint of what her wardrobe and interiors style revolves around: antiques from every corner of the globe (and internet), awesome thrifted pieces that we’d shy away from purchasing, cleverley-chosen high street bits that somehow manage to fit in, and a host of well-loved and well-worn accessories—if anyone could be a poster-child for owning your aesthetic and shopping sustainably, it’s Coco and her feel-good fashion collection. Phill Taylor On Coco: Vintage suit; Dolls Kill boots; Gogo Phillips earrings. I do. I had a dress that I wore so much when I was about three years old. It was a little pink dress that had Minnie Mouse on it, and my mum says that she used to have to wash it when I was asleep as I wouldn’t wear anything else. I always wore very girly dresses. And then me and my best friend had matching dresses—always. Actually one of the styles from the last collection is based on the ones we used to wear—a little gingham, three-colour dress. When did you first start to become really aware of what you were wearing? I think I’ve always kind of thought about it. Maybe when I was 13 properly, but both my parents are very kind of, not silly dressers, but they’re eccentrically dressed, so it’s always been part of the family. It’s naturally the look we gravitate towards I think. My style changes. I really like suits at the moment, but for a while I was wearing a lot of body-con dresses, and when I was younger I used to wear Betsy Johnson ball gowns, so I don’t know where it comes from—all over the shop, really! Phill Taylor On Coco: I.Am.Gia boilersuit; ASOS loafers; Gogo Phillips earrings. What’s your vibe right now? Slicked back middle-parting hair, big earrings, suits at night… And then in the day at work I’m kind of hopeless—it’s just jeans and a white T-shirt. I’m not very good at keeping it up all the time. When I go out I like to dress up but going to the studio I’m quite pared down. My interest in suits started about two years ago, but I like a boilersuit for the day as well. I tend to wear my suits with a big belt, some big, tall shoes and lots of gold rings and earrings, and then nothing underneath—as I say, there’s nothing much under there anyway so if someone sees something it’s not a big deal! Does anyone or anything influence your style? And do you have a style icon? Someone like (British photographer) Nadia Lee Cohen. I just like when people really go for it. Then there are loads of people who I think look great but I wouldn’t necessarily want to emulate them. I think my style It just comes from me… a lot of my friends would much rather blend in and wear nice stuff that other people are wearing, whereas I’m a peacock. I like peacocking and I like looking silly and flamboyant. I’m actually quite shy, so it’s almost a kind of barrier. Phill Taylor On Coco: Coco Fennell dress; Kurt Geiger sandals. What was the driving force behind setting up your own brand? Both me and my sister had fluctuated in weight quite a lot around the time when I started [the brand] and I think when we were both bigger, it was really difficult to find well-priced, flattering clothes. She was going to do it with me and then didn’t in the end, but I wanted to make flattering, affordable, girly clothes really. My dad’s a jewellery designer and my mum used to work for Thea Porter in the ‘70s and she also had designer dress sales in our house (like a kind of Outnet type thing, so it’d be like current season but discounted) so I didn’t train in it I did graphic design and art at school and I never had any formal training, but it’s always been around. I’m just so lucky that it’s worked out. I’m definitely designing for lots of different people but also myself, and there are pieces that I wear a lot more than others. And sometimes, you know, you look at these dresses everyday and you get to a point where you can’t wear them yourself without constantly dissecting them. Whereas when I see them on other people I think they look great! Phill Taylor On Coco: Vintage coat and earrings. Do you ever regret anything you’ve worn? Actually, I was talking to my friend about this yesterday. There’s a picture on the internet that is the worst thing in the whole world! I’m about 13 and I’ve had a really bad fake tan and I’ve got a pink tutu and a black silk corset on, and it’s just so criminal. It’s really funny but—ugh! I was really liking a corset then—they were very popular. There’s loads of stuff I look at and think it’s embarrassing, but I don’t really mind, I think it’s quite fun. Your look is so eclectic, just how and where do you go shopping? I buy pretty much everything online now, to be honest. I find the whole experience of shopping really depressing, especially in the shops that I can afford. It’s hot and the lighting is bad and you just don’t feel nice. I’m always at the Post Office anyway as I’m sending out orders, so me for me it’s super easy to have stuff delivered at home, try it on, dim the ol’ lights down—look at myself in the dark and it’s great! I would say the main shopping destination I hit is Zara— big time—and I mix that with vintage stuff and my own dresses. Shopping with friends is my nightmare… I couldn’t think of anything more boring than someone having to stand around while you try things on. Also I don’t really ask for people’s advice because they’d probably look at what I’m wearing and think I look insane. Phill Taylor On Coco: Coco Fennell dress; Kurt Geiger sandals; Pretty Little Thing belt. Clothes-wise, a dress covered in lobsters. And then some sparkly trainers. I just like silly stuff, you can tell by my house. I don’t like things that are too serious, whether that’s homewares or clothes or people! And is there anything you’ve ever spent a lot of money on? If you could only save one thing from your wardrobe, what would it be? It probably would have to be one of my dresses. I don’t really have an archive, I just have one of everything. So I’d be devastated to lose all of that, so maybe one in my favourite shape (the Gypsy). Shop Coco’s latest collection below. Thanks for having us, Coco!